The discovery of a hot Jupiter exoplanet that transfers orbital momentum to its host star may hold the key to a clearer understanding of the evolution of common planetary systems, according to findings presented by Dr. Edward Guinan, a professor of astronomy at Villanova University in Villanova, Pa.
Guinan announced the find at a press conference held at the opening of the 217th American Astronomy Society meeting in Seattle, Washington. The discovery is of special interest because it represents a rare case in which a research team was able to make an independent age determination of the planet system by studying the systems faint red dwarf companion star. The discovery opens a new gateway to learning about the dynamics and evolution of many other planetary systems that also contain close-in hot-Jupiter type planets. HD 189733b, the hot Jupiter exoplanet, orbits an orange (dwarf K) star HD 189733 in the constellation Vulpecula (the Fox). It orbits at only three percent of the distance of the Earth from the Sun: i.e. ~0.03 AU) with an orbital period of only 2.2 days (for comparison the Earth takes 365 days to orbit our Sun). 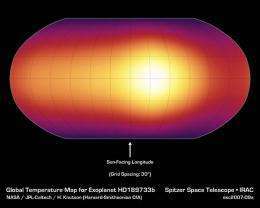 The host star is about 63 light-years away and has a mass and diameter about ~80 percent that of our Sun. This star, invigorated by its hot Jupiter planetary companion, appears to have been spun up (rotating ~ >2x faster than our Sun -- having a ~12-day rotation period) and is gaining angular momentum from magnetic and tidal interactions with its close-in Jupiter-size planet. The star, however, is being spun-up at the expense of the planets orbital angular energy. The loss in the planets orbital momentum in the past may explain why it (and other similar planetary systems) orbit so close to their host stars. While the planet is spiraling in toward the star, and is most likely doomed, there is a possibility that the interacting magnetic fields of the star and planet could create a tidal-magnetically locked orbit -- rotation that might allow the planet to survive. The most likely scenario, however, is that the planet will draw closer to the star and its atmosphere will be eroded away by the stars intense radiation and strong winds. The planet will ultimately be ripped apart by the stars gravity if it survives the stars radiation and winds. HD 189733 Ab is a relatively rare eclipsing planetary system that was discovered in 2005 (by Buchy et al.) 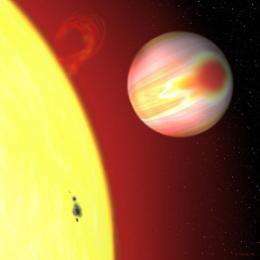 and has attracted much attention in astronomical circles because it hosts a transiting hot Jupiter exoplanet. The system is relatively bright (e.g., it can be seen with binoculars). The eclipses by the planet permit substantial information to be gained from observing the system inside and outside the planetary eclipses. For example, spectroscopic studies by other teams (e.g., G. Tinnetti et al.) reveal that its hot atmosphere contains water vapor, carbon dioxide, sodium, and, interestingly, organic molecules of methane and particulate haze. The Villanova team, which includes undergraduates Thomas Santapaga and Ronald Ballouz, found that this system is over five billion years old. The Jupiter-size planet has been estimated to be very hot at ~1,500 degrees Fahrenheit by other researchers. HD 189733b has one of the shortest known orbital periods of only P = 2.22 days and is only 0.031AU from its host star (i.e., only ~8.75x the radius of the host star). The exoplanet system includes a cool red dwarf companion star (HD 189733B). 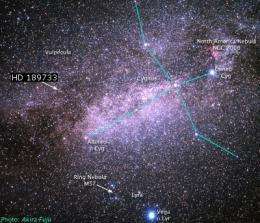 This faint companion star is located at ~12 distance to the K-dwarf. At the distance of HD 189733 this corresponds to a separation of ~220 AU. (For comparison this is 220x the distance of the Earth from the Sun, or over 5.5x further than the distance of Pluto from the Sun.) The presence of this red dwarf star makes a reliable age estimate of the binary system possible via activity-age relations developed at Villanova. Of the over 500 exoplanets that have been discovered to date, HD 189733 is the only one of a handful whose age and physical properties have been well determined. Studying these planets and their systems can help astrobiologists determine where best to search for habitable worlds beyond our own solar system. This study may help explain how and why hot Jupiters form and evolve. It may help explain this whole class of planets, Guinan remarked. In conducting this study the research team, which includes Villanovans Thomas Santapaga, Ronald L. Ballouz, Scott E. Engle, Laurence E. DeWarf, along with Styliani (Stella) Kafka from the Carnegie Institute in Washington, D.C.s Department of Terrestrial Magnetism, observed the exoplanet system using the Clay Telescope at the Carnegie Institution of Washingtons Las Campanas Observatory in Chile. Observations of the eclipse timings of HD 189733 continue at Villanova using the Four College Automatic Photoelectric Telescope (FCAPT) located in southern Arizona. The eclipse timings made with this telescope over time could provide evidence that the orbital period of the system is indeed decreasing. Guinans Jan. 10 presentation of the teams findings at the 217th AAS Meeting are from a paper titled, Some Like It Hot -- Evidence for the Shrinking Orbit of the 2.2-day Transiting Hot Jupiter Exoplanet HD 189733b -- Evidence of Transfer of Planet Orbital Momentum to its Host Star (AAS 217th Meeting Abstract 343.12). One of the most amazing results of our teams research is that a planet-size body that is only 1/1000x times the mass of the host star can make such a large impact by magnetically interacting with its host star to the extent that it causes the star to spin up, activating a strong magnetic dynamo of the star that produces the observed strong X-ray coronal emissions, large starspots and other phenomena, Guinan concluded. Does this imply that our Sun has *not* ingested a Hot Jupiter ?? What's funny is that nay-sayers here on earth will tell us.. naaa Earth/Jupiter/Saturn don't impact the sun's influence... but we're happy to believe it happens on stars we observe out there..
You don't think Jupiter being at 5.2AU and HD 189733b being .03AU makes any difference in the prominence of the effect, right?